A domestic violence victim in ‘emotional turmoil’ set fire to a car belonging to his partner’s mum after becoming frustrated with the police. Nigel Moore, from Pond Hill, Cliffe, Rochester, had been in a relationship with a man from Shoreham in which there had been ‘a number of domestic incidents’, a court heard. After a night of drinking Moore turned up at the man’s home in Shoreham, poured petrol under a Kia Picanto that was parked outside and set it alight. Moore, 53, pleaded guilty to arson relating to the June 2018 incident and was sentenced at Hove Crown Court on Friday. Prosecutor Beverly Cripps said: “At between 11.30pm and midnight that night, the victim was woken up by a large bang. The blaze damaged the car beyond repair and left the victim in a state of constant fear, the court heard. In a statement, she said: “The incident has made me feel anxious in my own home. “Every noise outside I fear the worst. 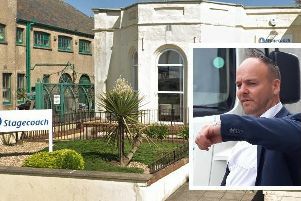 Defence barrister Richard Cherrill said: “The defendant is mortified, deeply sorry and in a state of some lack of understanding as to how he could have allowed himself to do something so awful. “He got himself in an emotional turmoil. The court heard that he reported the domestic matters to police but became frustrated at the time being taken. Sentencing Moore, Recorder Adrian Chaplain said: “The horror of fire is almost literally elemental. He took Moore’s good character into account and decided not to send him to immediately to jail. Moore was given a two year prison sentence, suspended for 18 months. He was also ordered to complete 150 hours of unpaid work, rehabilitation, pay £1,149 in compensation and pay prosecution costs of £1,500.